Pen and brown ink over traces of black chalk. Lined. On laid paper bearing an unidentified watermark with a cartouche surmounted by a trefoil. Brown ink border, 227 x 161 mm. In a 19th century mount numbered and inscribed Sabatelli. 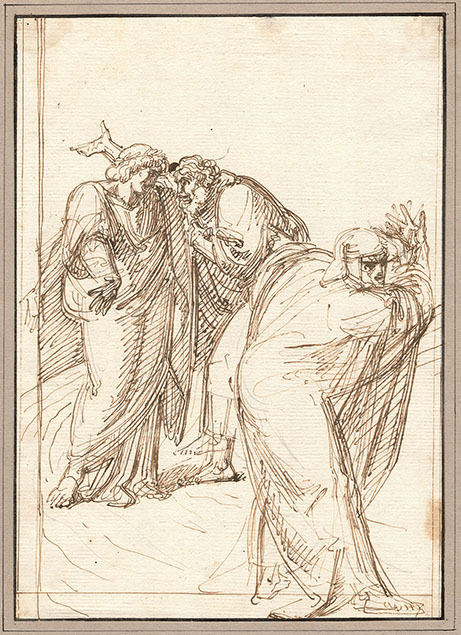 The theme of the meeting between Virgil and Sordello, followed by Dante's invective against the political ruin of Italy (Ahi serva Italia, di dolore ostello), is dealt with in another drawing by Luigi Sabatelli, kept in the Uffizi (inv. no. 92538), which was published by Beatrice Paolozzi Strozzi in her 1978 catalogue. 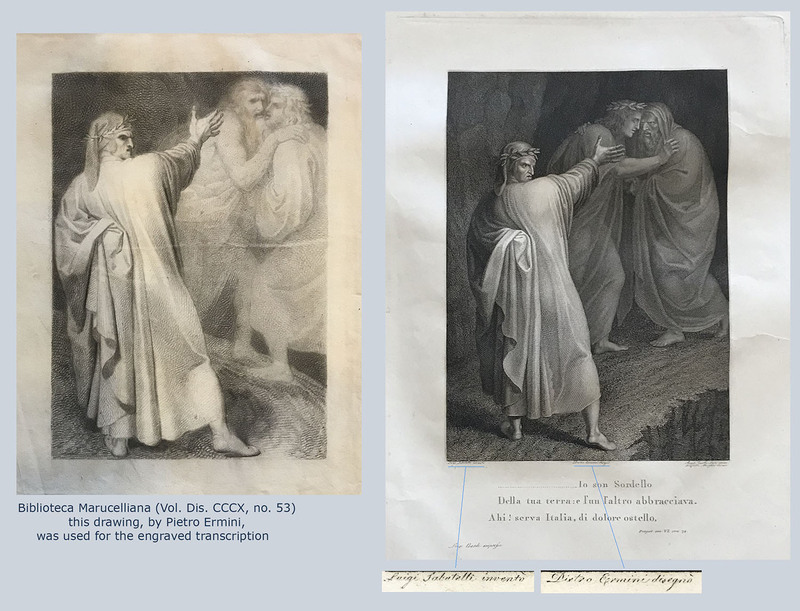 The scholar has related the Uffizi drawing to a print engraved by Emilio Lapi and she has identified at the Marucelliana Library (Vol. Dis. CCCX, no. 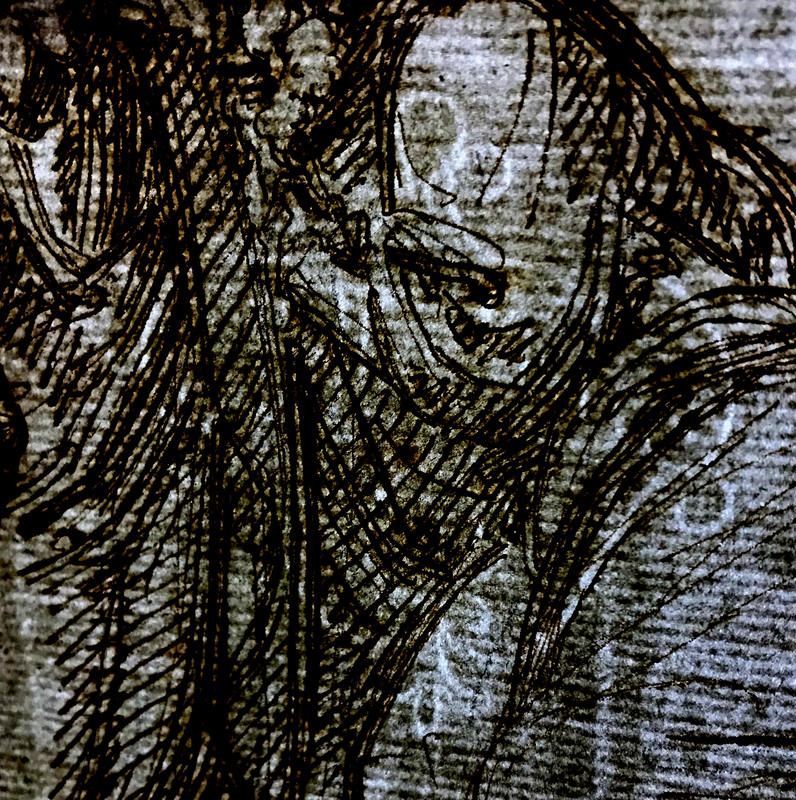 53) a version in black chalk of the Uffizi's drawing, used for the engraved transcription. 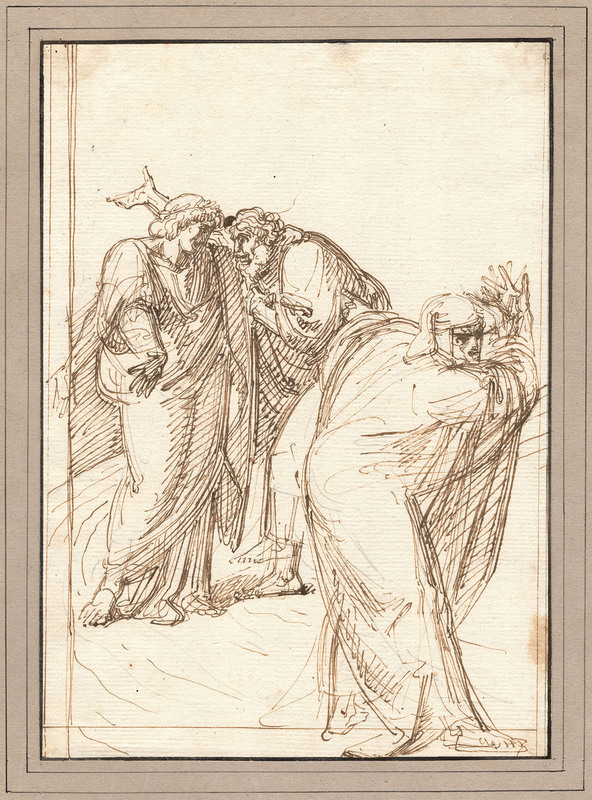 However the Marucelliana drawing is not by Sabatelli but by Pietro Ermini, as precisely indicated in the engraving. 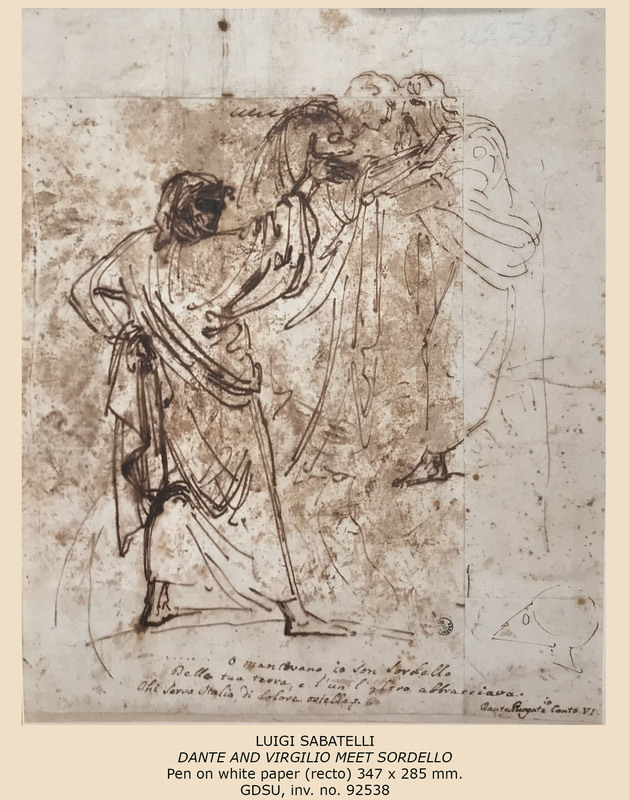 Luigi Sabatelli’s drawings inspired by Dante’s Comedy are generally referable to the artist's Roman stay (1788-1794) See, for example, the numbers from 13 to 16 in the 1978 catalog. 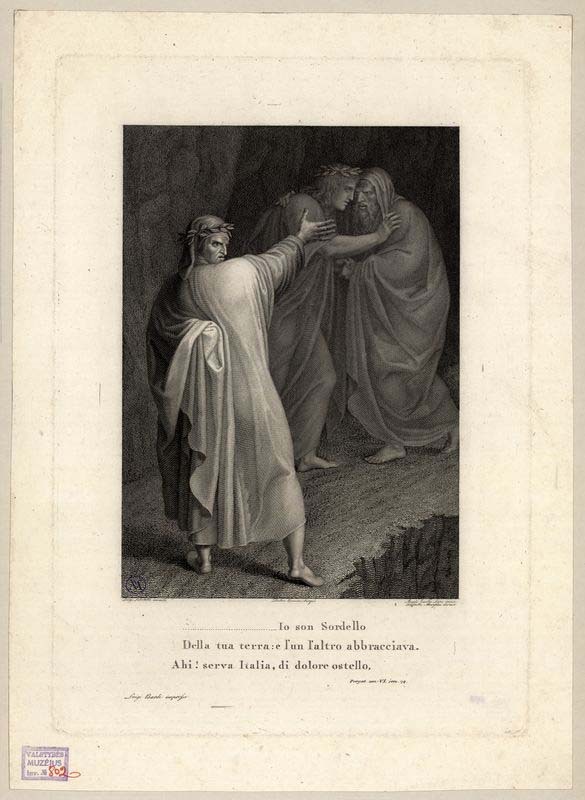 The drawing presented here dates back to those years, as the laid paper suggests and as confirms la terribilità of Dante's expression. REFERENCE: Beatrice Paolozzi Strozzi, Luigi Sabatelli (1772-1850): Disegni e incisioni, catalogue of the exhibition at the Gabinetto disegni e stampe degli Uffizi, Florence 1978. Sabatelli was the most talented of the Tuscan painters of the generation after Pietro Benvenuti. He was born in the house of Marchese Pier Roberto Capponi, in Florence, while his own father was in domestic service there. The Marchese Capponi was Sabatelli's early sponsor, financing his education at the Florentine Academy and his sojourns in Rome and Venice. In 1808 Luigi Sabatelli was appointed to the chair of painting at the Brera Academy in Milan. There he remained over forty years, although he continued to carry out commissions in Tuscany. During his mature years, Sabatelli established himself as a decorator and fresco painter, with numerous public and private commissions. Sabatelli was a fine painter and one of the premier pre-romantic draftsmen of nineteenth century Italy. He was also an accomplished etcher. See Beatrice Paolozzi Strozzi, Luigi Sabatelli, disegni e incisioni, catalogue of the exhibition at the Gabinetto Disegni e Stampe degli Uffizi, Florence, 1978.